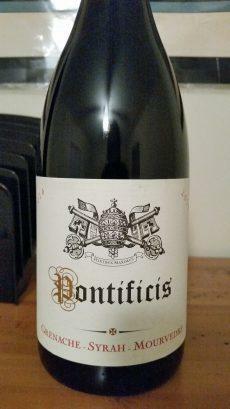 The Pontificis GSM 2014 is a blend of 40% Grenache, 33% Syrah and 27% Mourvedre, sourced from vineyards in the Languedoc region of France and is a $6.99 Trader Joe’s import exclusive. The GSM blend is one of the classic Red wine blends from the southern Rhone Valley in France and the Chateauneuf-du-pape region in particular. The name roughly translates to the castle of the new Pope, which dates back to the 1300s when the Pope moved to France when he some problems in Italy and the Pope became a patron to the local wine industry. The name Pontificis is a shout-out to those iconic blends, even though the grapes are not grown in the Rhone. The Languedoc is located in southern France, the border to Spain is its southern boundary and the Mediterranean Sea is the eastern border. The GSM blend melds the silky, sleek fruit of Grenache, with the plump, slightly spicy fruit of Syrah, along with the darker fruit flavor and structure of Mourvedre. The color is a clean, clear cranberry red with some dark highlights. The nose is raspberry and spice, black cherry and plum, subtle and pleasing. The Pontificis GSM is on the light side of medium bodied and the flavors are clean and focused. It tastes of red berries along with a savory note, blackberry, licorice and a slight grip from the tannins. The mid-palate is subdued, but shows strawberry and a hint of bitter chocolate. This is no fruit bomb, it is definitely made in the French style. Well balanced, with enough structure, tannins and acidity to work well as a food wine. The finish is light, but never really goes away. The Pontificis GSM 2014 is a very useful, medium to light bodied Red wine. It drinks well on its own and has enough structure to hold its own with beef stew or even BBQ. While not as lush and deep as better GSM blends from the Rhone, it does a very nice job for a $6.99 wine.